Colour photo of a 1956 Dodge Coronet Coupe with extensive rust and weather damage to the body surface. Chrome detailing is intact and attached to coupe but also suffers from pimpling causing the chrome to lose its lustre. 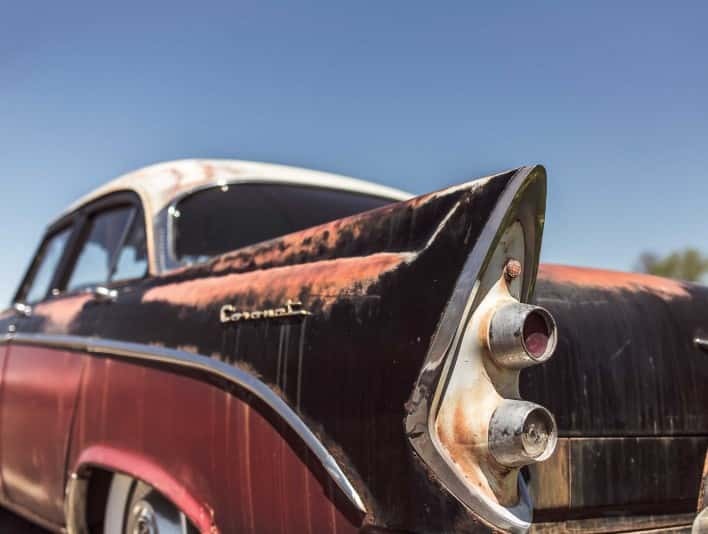 The rust damage on the car is likely due to extended periods of exposure to the weather as the rust has has time to leave traces of itself as it drips down the side of the body panels. The wheels have the stereotypical 1950’s white walls and chrome hubs, the roof of the car is painted white. A clear blue sky commands 40% of the composition for this photo and serves as a powerful backdrop. The winglets are featured prominently in the foreground with cracked plastic indicator lights.